As you may remember from previous posts I’ve been buying onion transplants from Dixondale Farms for many years. They’re not organic farmers — although Bruce Frasier (the family member now in charge of the 100 year old family business in Texas) has written about the farm’s attempts to grow at least some onions organically. I plant at least 1500 onions a year and being able to order transplants is very convenient. I never worried about them not being organic to start out — because by the time the tiny transplants get established and grow to maturity in my wonderful soil — I feel they’re just fine and free of any chemical fertilizer by harvest. Last year I started experimenting with onion seed — the only veggie I didn’t already start from seed. I’m too dependent on Dixondale and need to become more self-sustaining. Starting everything from seed is a significant step in that direction. Onions are easy to grow, BUT it’s a question of how much time you have to get them up and growing in the garden in time to develop strong roots and a lot of “leaves” before daylight hours trigger bulbing. Without ample time to grow you get pearl-onion sized onions. Thus far, my transplants that I’ve grown from seed have not been big enough to produce the size onion I want when transplanted to the garden. The ones I get from Dixondale are various sizes — but most are big enough to grow to maturity in my garden. Various sizes of onion transplants that I plant in February. I consider the one second from the left in my hand the perfect size. Any smaller than the smallest size shown is probably too small to have enough time to grow to maturity in my garden. If you have enough light and you can grow indoors — you shouldn’t have any trouble at all growing onions from seed if you start early enough. In my area that would be towards the end of January. I’m not set up to grow indoors. I grow everything in jugs (outside) which act as mini-green houses. Everything does well with this wintersown method. But the onions don’t do as well as I want them to do. 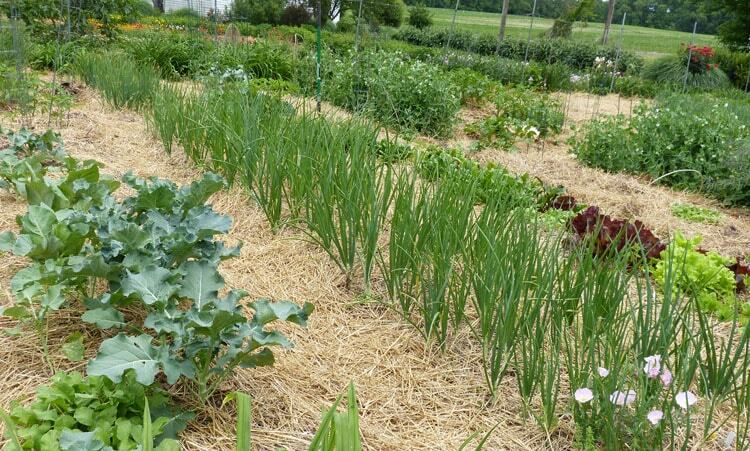 you’ll have small onions that you can cure and plant as onion sets either in the fall or coming spring. Dixondale has a chart on their site that determines what they feel is the proper time to plant transplants in your area. I NEVER go by this chart. If I did — my onions would not have enough time to grow big before daylight triggered bulbing. According to their chart I’d be planting about the 11th or 12th April which I’ve found to be way too late. This is how much the transplants have grown by April. A couple of year ago I helped a lady in North Carolina determine what she had to do to get a good crop of onions. She had never been able to grow onions any bigger than pearl onions. After I had all the details of what she was doing — it was an easy solution. She was planting too late (first week in April) and was planting two inches deep rather than the one inch depth that onions love. She now plants the middle of February. She uses transplants and only plants an inch deep. She gets wonderful onions. Contradicting their chart on planting dates — at least in my area — a Dixondale newsletter advised gardeners to begin planting transplants 4 to 6 weeks before the last frost date in their area. If I use the frost-date chart that Dixondale provided (different charts will show different dates) my last frost date would be about April 6. Planting 6 weeks before that would be just about right. 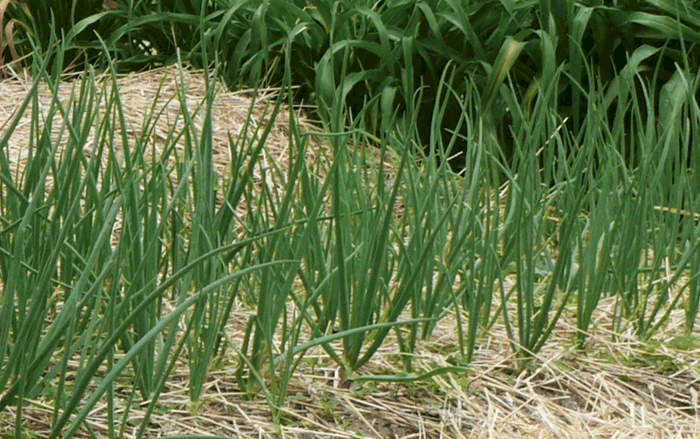 I usually start staggered plantings of onions the 2nd or 3rd week of February through the first week of March. This way the plants have plenty of time to grow bigger before daylight hours trigger bulbing. This is what the onions transplant look like about 3 months later in mid May. They’ve had plenty of time to grow before bulbing starts. The longer you garden and pay attention to what your onions do each year — you can fine tune the perfect planting date for onion transplants in your garden. Until then – generally speaking, 6 weeks before your last frost date is not a bad rule of thumb to follow. Numerous varieties of cured onions in December. Theresa, By reading and following your blog guidelines, I too had a wonderful crop of LARGE onions last year – first time ever. I have seedlings just germinating now, indoors, and plan to put them out in a day or two. I wish I’d started them a bit earlier, but I had to wait to get seed. Interestingly, all the onion seeds were sold out in my local store – so maybe others know this secret too. 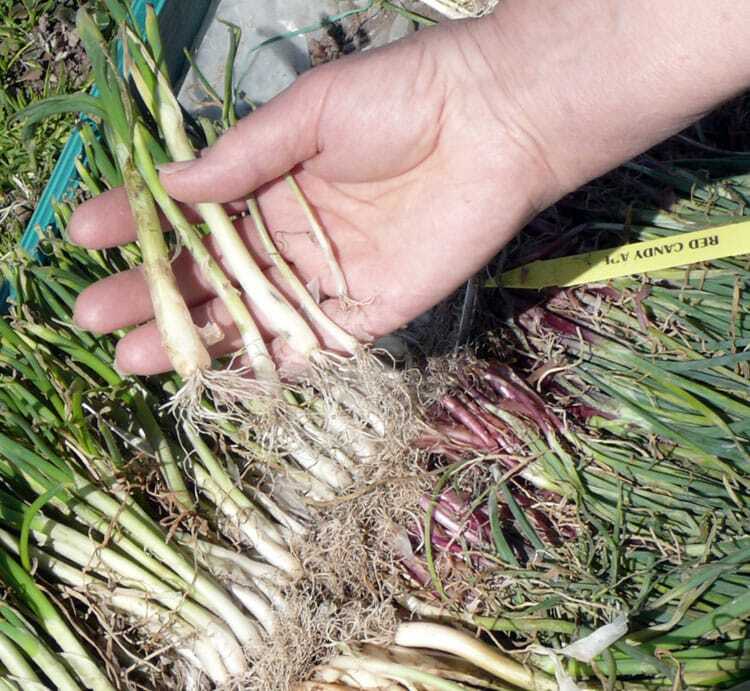 It makes me crazy that even the onion growers/sellers (and cooperative extension) don’t provide accurate information about planting so that you get the best results. Any ideas why? Have you ever mentioned this to Dixondale? No, I have not mentioned this to Dixondale Sandra. They are the largest growers of onions in the world and I don’t think they’d pay much attention to me. It really does amaze me the “not so good” info that is out there from sources that people go to and trust. Your question is a good one and probably why Dixondale has their chart that shows my planting date as after my last frost. They don’t want to be responsible for conditions out of their control and in an effort to be right for everyone —- they recommend plantings that are too late for my area. There is no way I can tell you about your area — since I’ve always gardened in Virginia. Start out with 5 succession plantings of onions. 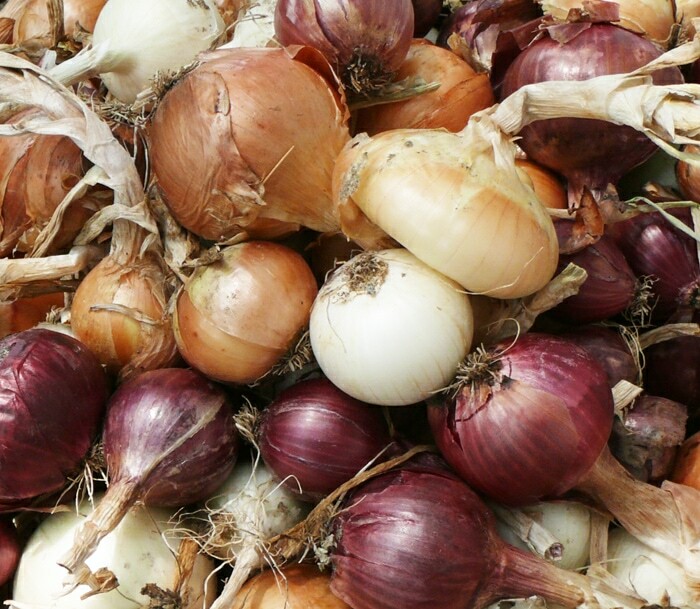 The first four plantings don’t have to be very many onions — just in case you loose them – which you probably won’t. Four weeks from your last frost date plant at least a dozen onions. Then three weeks from your last frost date plant another dozen. and then finally on your last frost date plant the remaining onions. This will be a good test to tell you what you can and can’t do in your area. You can fine tune your planting date more and more with each year. It’s probably not the snow you have to worry about — as much as the bitter freezing cold. We don’t always get a lot of snow here but I’ve had my onions under a foot of snow during years that we have heavy snow fall. All was well. No matter when I plant —- I mulch. Read all my posts on onions and you’ll have a lot more information to work with. I’ll be very interested in knowing how you do. Please let me know. I grew onions for the first time last year & followed my state’s Ag Dept recommendations for planting dates. I’m in 9B. I planted transplants from DD around 01/15. Those were harvested the first week of May & were great. I experimented with growing from seed this year & transplanted them 12/04. That’s pushing it a little, but we’ll see how it goes. As a backup, I also ordered from DD & I’ll get those the first week of January. I think next year, it’s going to be all of my own seed grown transplants. Good job Jo-Ann! Thanks for sharing what you’re doing.